The two Bulls who went to the All-Start game, Leslie Anderson and Dane De La Rosa, did just fine. Anderson got a couple of hits and De La Rosa pitched a scoreless inning. Nevertheless, the PCL beat the IL 3-0 to a huge crowd of 18,000 folks up in Buffalo. Box score. The Bulls get back in action tonight against the Charlotte Knights. 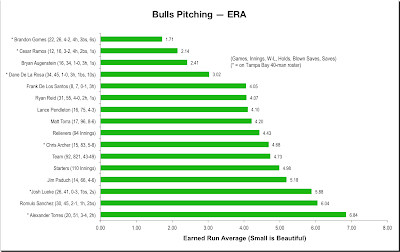 Let’s take a look at the not-very-attractive state of Bulls pitching. First are the running totals of team earned run average over the last 20 games with separate tracks for the starters and relievers. 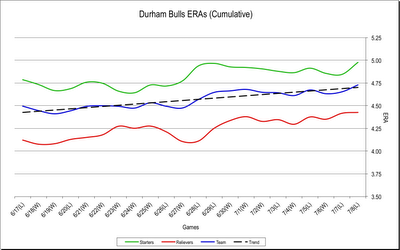 About all that can be said here is that the relievers are doing slightly less worse than the starters. 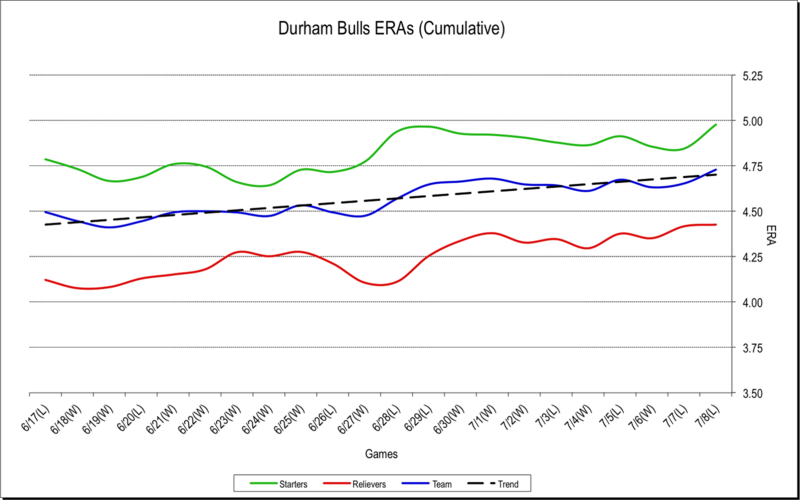 The Bulls’ ERA is the worst in the International League. And the trend is slightly upwards. 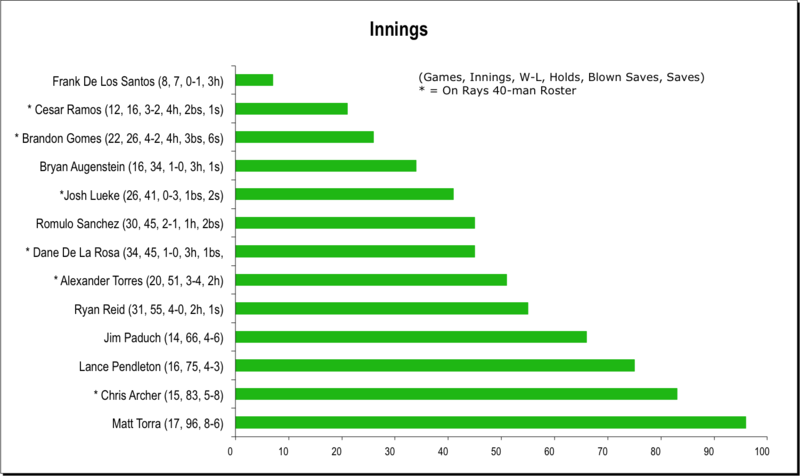 Before we look at individual stats, here’s a reminder of the huge spread in innings pitched among those on the current roster. It ranges from starters Matt Torra at 96 innings who has been with the team all year to the 7 innings put in by reliever Frank De Los Santos who recently came up from Montgomery. 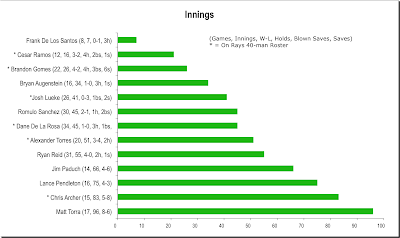 Several of these men have spent some time with Tampa Bay and Montgomery this year and those innings are not shown on the chart. 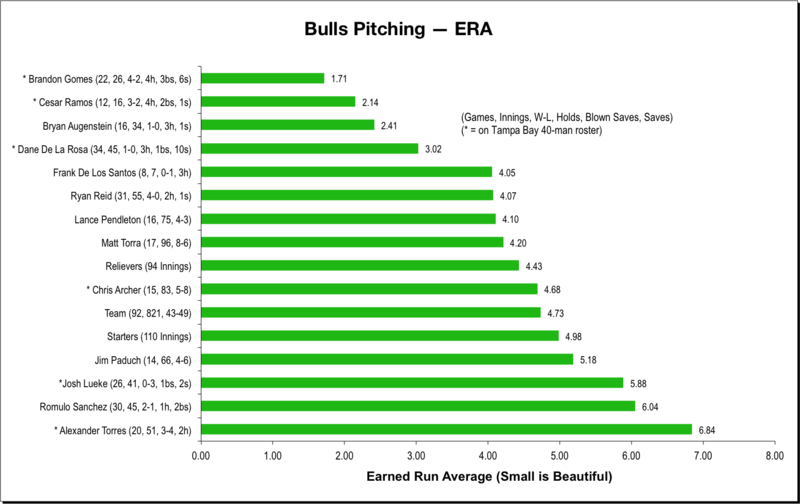 This chart breaks it out ERA on a individual basis for the pitchers currently on the roster. 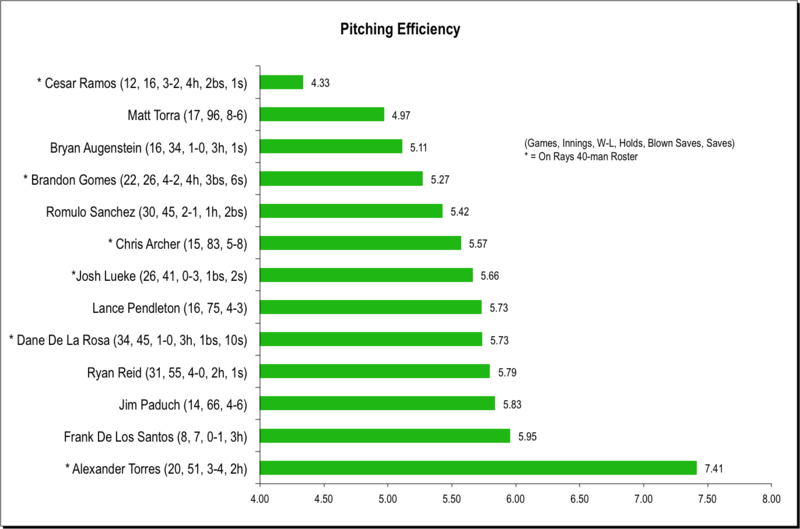 The first chart includes all pitchers, all season. Three fairly obvious clusters jump out: short relievers Gomes, Ramos, Augenstein; a middle clump; and then long relievers Leuke and Sanchez. 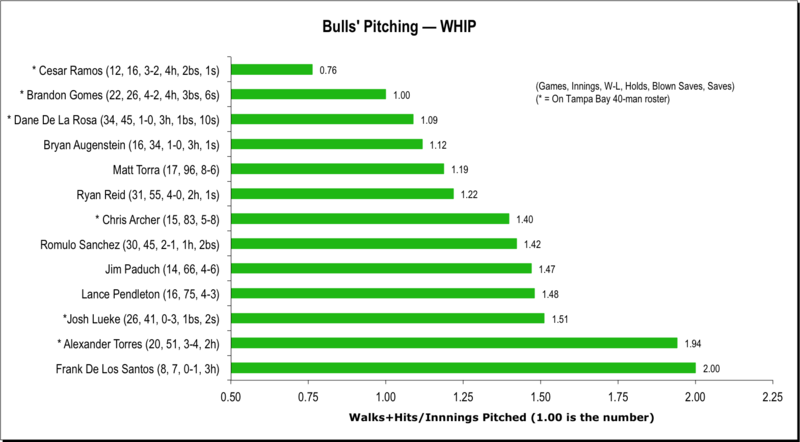 Alex Torres is something of an outlier. 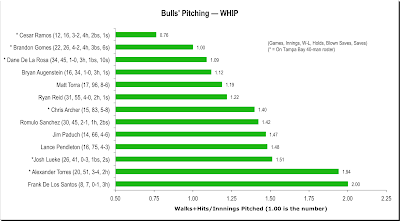 Walks and Hits per Inning is another interesting stat that shows off two of the Bulls’ starters, Chris Archer and Matt Torra. 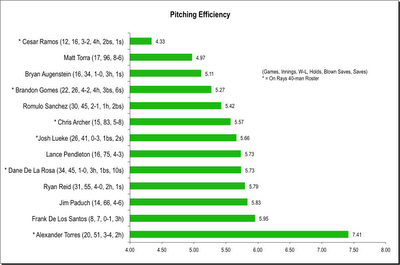 Lastly is a home-brewed stat, Pitching Efficiency, or how many pitches it takes each pitcher to get to get an out. Matt Torra and Chris Archer lead the starters in this category. And we see again how much of an outlier Mr. Torres has become this year.